StorDigital 15 Target 20X DVD 40X CD copier & 100 disc auto printer from MicroBoards. 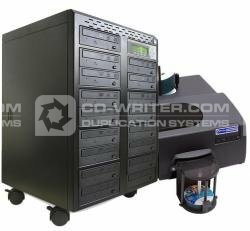 This industry leading high capacity duplication solution is guaranteed to meet your output requirements. Burning 15 discs simultaneously and printing 100 discs in under 25 minutes this high capacity bundle offer is designed to deliver. Featuring a Standalone, No PC Required duplicator (with inbuilt 250gig HD), and 100 disc professional USB connected printer. This unit is fitted with 250GB hard Drive as standard. Call 020 8293 0777 for more information. StorDigital . SD15 . DVD . COPIER . AND . PRINT . FACTORY . PRO . PRINTER . OFFER . Systems .